Amma, through spirituality, what is the goal you are setting? God is not an individual who rules the world, sitting somewhere beyond the sky. He is the consciousness that pervades all beings. This world is the directly manifested form of God. Realize this truth. Do all actions being firmly established in that truth. Without expecting anything from anyone, love and serve everyone selflessly. Even when Amma is standing alongside the common people [i.e. supporting and assisting them], some people still are trying to target you with the threat of allegations. Ultimately, what does Amma have to say about the severe criticisms that came in Gail’s book? Anyone will become angry if their desires are not fulfilled. The intellect’s ability to judge things properly is destroyed. Then they say many things without thinking. An individual who feels that ashram life is not for him has the freedom to leave the ashram anytime to get married. Even now, Amma is only filled with love for that daughter. I am praying that goodness and wellbeing come [for her]. The truth will shine forth in time. I hear that Gail came to the ashram just with the clothes on her back. Do you remember that? I remember it like it was yesterday. Those days, there was only one house where my parents and siblings lived. There was no ashram yet. A hut was built first on father’s property. Later, he donated 10 cents of land. The math was registered in 1988. When that daughter came, I did not ask who or what she was. Everyone has shown nothing but love to that daughter. I cannot understand why she later wrote like this. How do you want to respond to Gail? Gayatri is still my daughter. She always will be. Reaction and revenge are not my way. My way is acceptance—to welcome everything. However, the devotees have deep sorrow. I have advised them not to express their feelings, to forebear and forgive everything, to pray for that daughter and so on. But not everyone is a sadhaka [spiritual seeker]; not everyone has understood the spiritual principles. For some, the mental attitude [with which they view their relationship with Amma] is one of a mother and child. I don’t know whether those who see Amma as their birth-mother can forgive this. Let grace bless those children to have forgiveness. Is there any possibility for your American disciples to take any legal action against Gail? Amma is not a member of the trusts registered in foreign countries. The trustees are devotees from the corresponding countries. I go there because they invite me. They are all deeply hurt by this incident. They are adamant about filing a lawsuit. Amma has asked them to forgive. But Amma cannot say what they will decide to do in this particular circumstance. Amma, doesn’t it hurt you when someone who once took refuge in you now speaks so virulently? Why? I have a dharma—the dharma of a mother of children ranging from newborns to 90- and 100-year-olds. Among them are those who speak so many different languages. They come from different cultures and have different types of personalities. They come from different religions, from all walks and stages of life. When I have the huge responsibility of guiding them, there is no place in my life to be sad, feel hopeless or to try to defeat those who accuse or criticize me—only love. This is an age where even birth-mothers harm their children. When even birth-mothers cannot control their anger, how are you able to do it, Amma? My attitude is not that of a birth-mother. It’s that of a spiritual mother and guru. That is a higher dharma than that of a birth-mother. For the good of children, sometimes I will advise them or speak to them in a serious manner. In the same way that a student is given “tuition” [tutoring] for a subject in which he is weak, true help is to help others in correcting their own mistakes. Otherwise, what is the meaning in them calling me “Mother” and me calling them “children”? I see the shortcomings of my children as my own shortcomings. Therefore, Amma will try to nurture [in them] alertness and discriminative awareness. But that is not by hitting or shoving or aggression. Amma does not believe that change can be brought about in anyone using such methods. I am trying to teach my children through the example of my life. How did you get the power to spread joy in everyone? That power is not only in me; it’s in everyone. God’s infinite power resides in each of us. Inside a tiny seed is a huge tree. But the seed is not a tree. It must become a tree. “God and I are one”—this is the real reality. When one realizes that truth, there is peace. That [peace] then can be given to others. Amma, who is your spiritual guru? There is no special individual like that. For those who can perceive things with the inner eye, Nature is the maha-guru [great teacher]. Damayanti Amma’s [Amma’s mother’s] disciplining helped a lot. Why did you feel the necessity for a Math? That was not Amma’s desire. The children all decided together. Amma has only one sankalpa [conviction]; that is compassion. What is it in Amma that attracts so many people? I don’t know. It might be the amma bhava [the motherly attitude]. Innocent love is humankind’s real nature. That is what is closest to his true self. Attraction to the place where that love can be directly experienced and received in the heart is only natural. That love is like a powerful magnet. Everyone is attracted to that. If a child smiles at us, even if it is the child of one of our enemies, we will, even without thinking about it, smile back—won’t we? There is an attraction in a child’s smile that no one can deny. That is how innocent love is. Amma, devotees long for your hug. Yet another group criticizes this the most. Isn’t it natural for a mother to hug her own child? There, motherly affection is all that exists. For me, all are [my] children. This way of Amma’s happened naturally. When there are other people around, children want to tell me about their pain secretly. For that, they would lean on my shoulder. They would burst into tears talking about their problems. When they would cry, Amma would wipe away their tears. Sometimes, they would fall on my lap, exhausted. Amma would console them. The next person would also have sorrows. In this manner, this way started. I became like a river, not like a railway. When someone falls down, do we lift them up off the ground only after seeing whether they are a man or woman? To ask Amma why she is hugging everyone is like asking the river, “Why are you flowing?” I have nothing to say to those who are criticizing. Because no matter what I say they will not understand. Moreover, they will only misinterpret. On some social network sites people proliferate the idea that, since the Pope washes the feet of children, it is wrong for devotees to wash Amma’s feet. What about that? The Pope has his path. Amma’s path is this. It’s not that one is good and one is bad. Why is it that a comparison is being made? Not even two leaves of the same tree are the same. Cultures and observances are different. However, the core principle behind all religions is spirituality. On Janmashtami [Sri Krishna’s Birthday], children come dressed up as Krishna. Their mothers bring them to Amma, and Amma puts them on her lap and kisses their feet. [Often] people with injured legs come. Amma strokes their legs. If there is a death in the ashram, Amma kisses the forehead and feet of the dead body. I am always bowing down before everything. In India, the tradition is to view the guru-disciple relationship as pure and great—the ultimate. Guru pada-puja [ceremonial washing of the guru’s feet as a form of worship] is part of that. There, it is not the individual but the divine qualities that are being worshipped. Amma tells the devotees, “More than washing my feet, a greater puja is to go outside and clean the gutters and serve people who are in sorrow.” I am not interested in having puja done to my feet. But sometimes children will insist. Then, for their happiness, Amma will give permission. Doesn’t the Bible mention that a devotee washed Jesus Christ’s feet with perfumes and dried them with her hair? It was that devotee’s satisfaction that was what was seen by Jesus. Some criticize Amma, saying that Amma assumes the costumes of Krishna and Devi. We are living in a society where, every day, human beings taken upon so many costumes/roles. The lawyer has his costume. The policeman has another. These costumes hint at their authority and position. The Krishna and Devi bhavas manifest the principle of God that resides in each of us. God is the personification of beauty! These bhavas are for my children. They give strength to their devotion and faith. It is the principle behind [these bhavas] that is the important thing; that transcends all costumes/roles. All [these bhavas] are to [help my children] reach that state. Not everyone has knowledge of the scriptures or is a spiritual seeker. Don’t they also need a way to blossom spiritually? Through all the various names and forms we are worshiping the one and the same God-consciousness. The Pope also wears a crown. Chaitanya Mahaprabhu had Krishna and Radha bhavas. Some bhavas are also mentioned in the life of Sri Ramakrishna Paramahamsa. How is a typical day of Amma? Some time for taking a bath and other such things. I eat only once. Sometimes, I cook for myself and eat. At the most, I rest for one or two hours. Sometimes, even that’s not possible. It can be said that sometimes I really don’t know whether it is day or night. If I come to sit at around 10:00 or 11:00 in the morning to see the children, it may extend into the next day. There are more than 3,000 residents in the ashram. Tuesdays are for them. Everyone will sit together from morning for meditation. Later, Amma will answer their questions. Amma will serve food to everyone. Amma will give darshan to those devotees who have come for just that day. On Mondays and Fridays, everyone will go the seashore and meditate together. On those days also, there will be question-and-answer sessions and darshan. There is a lot to do when I am in my room also. I have to read hundreds of letters. There are many service-oriented activities taking place throughout the world. There are many institutions. I have to give the needed guidance and advice to those who have been entrusted with them. I have to pay attention to the matters relating to the ashram residents. In the middle of all this, I have to visit Europe, America, Australia and other countries. There also, I spend most of the time with devotees. It has been 27 years since we have started traveling around the world. Amma has not gone for sightseeing or vacationing in the middle of this. There’s no time for that. Sometimes, I glance through a newspaper. There are those who say that the Math is financially stronger than the government. I don’t believe that. Anyone who can think even a little bit will not say such a thing. Whoever is saying that must have an ulterior motive. Or they are exaggerating. We should do good for society. That is the only thing Amma is thinking about. And it is based on this that Amma is acting. Amma, how are you able to speak on so many subjects? Ah… I do not know, daughter. I just always say what I feel at that moment. Knowledge is not outside. It’s within—isn’t it? We can gather information from outside. But the true source of knowledge is within each of us. If we can know that, we can know everything. Amma, how are you able to manage all these organizations? I will do what I think is necessary at every instance and circumstance. If the children have doubts, they ask me. They ask for instructions. I just say what I naturally feel in my mind at that moment. All this is happening with God’s grace. Do you keep an eye on expenses? It’s not possible for me not to! It is with the utmost care that everything is being done. Amma just drinks the water given to her by devotees without even looking at it first. Can you have so much trust in those with you? When one sees everyone as [her] child, then there is no place for fear. Of course, one day this body will perish. I don’t fear death. Rather than letting the body rust away, isn’t it better for to wear it out, doing things that are good for the world? 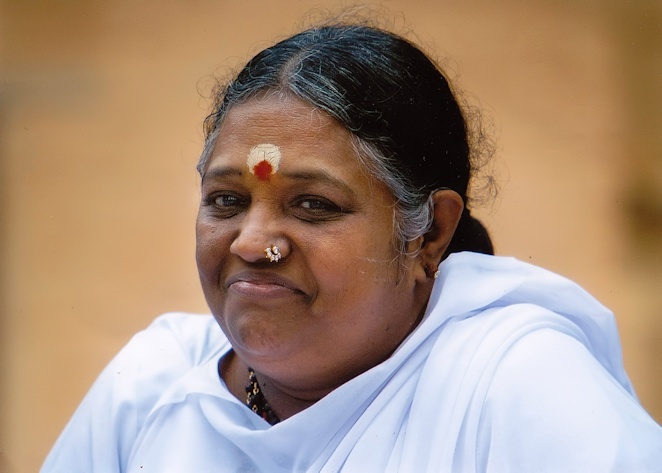 “It is mostly the wealthy who follow the path of devotion.” Amma, what do you think about that? That’s incorrect. The majority of the children who come to see Amma are poor. Devotion means love. There is no one in this world who doesn’t have love. But its source is within. It should awaken. From love’s perspective, the poor and the rich are not different. If there is no love, there is no life. Therefore, love and life are one. Devotion is the highest state of love—that state where two become one. Throughout the entire world, everyone says, “I love you.” When it is said like this, both “I” and “you” are there [remaining separate]. But “I am love itself” is the supreme truth. Love is not a meeting of bodies; it is a meeting of hearts. There [in love], there is no differentiation between the two people. Who are your favorites among the politicians? Because I have no special political preference, I view them all as one. It is not the individual, but God, who is inside all individuals, that I see. Amma, what is your political preference? Politics is not my dharma. This is election time. Amma, have you voted? I can only vote for one candidate—isn’t it? I would have considered voting if I could have voted for all of them. Amma, do you think about the future of all these big institutions after your time? I don’t think about that. The present moment is the time to make changes and corrections. Whatever transformations you make now will reflect in the future also. Put in as much effort as possible. Through your words, thoughts and actions, do good. Leave the rest to time. Great interview with Amma where she directly addresses some of the accusations against her while maintaining the highest road. I think Gail is a Psycho.I dont know how she can accuse mother like this after experiencing ammas love,Even if amma forgives her, I dont think God will never ever forgive Gail.